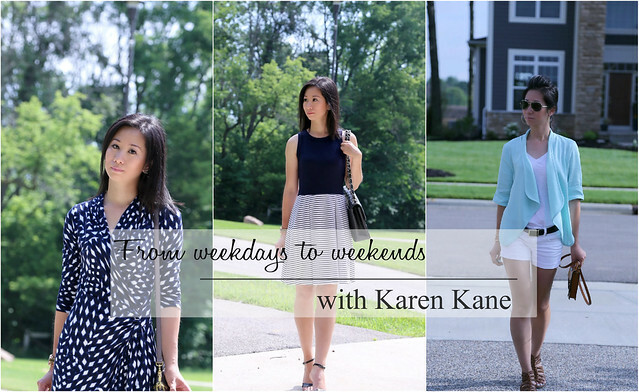 This week, I am teaming up with Karen Karen to show you 3 looks that will take you effortless from weekdays to weekends. Karen Kane is a relatively new brand to me. If you are a longtime follower of this blog, you know I am always on the lookout to try new brands. Can't really remember the last time I actually bought something from typical mall stores. For an office-appropriate look, I picked out this wrap dress. I am a huge fan of wrap dresses. This is the fourth one I own. They're just so easy to wear and make me feel instantly polished. As far as sizing goes, I would say it's very similar to Ann Taylor regular sizing. Karen Kane does offer plus sizes but unfortunately, no petite sizes. All pieces featured here are in regular sizes. Hence, they were just a tad big on me throughout. The overall 38" body length went well past my knees (I am 5'2"). Again, this dress was designed for a regular-height frame. I took off 4 inches from the hem to balance out the proportion. Other than the length, no other alterations required. The gathered part of the dress hits right at my waistline. I also like the fact that it's a faux-wrap dress so I don't have to mess with the ties. Shoulder to shoulder = 15". Fabric contains 95% viscose 4% spandex. Made in the USA. All in all, this dress is sophisticated, flattering and is a great staple to my closet. The print on that dress is super cute...would be nice to see petite sizes offered! The dress looks great on you, and I love the picture with your sunglasses off. :) Your eye makeup looks really nice there. Can't wait to see the next looks in this series! Love this beautiful wrap dress! You look amazing in it, i'll have to check out Karen Kane myself! great dress and love the print... you are right, totally work appropriate! What an amazing dress! It was made for you! this dress is amazing! I love the print and color. you look very lovely! Sydney! That dress is gorgeous. I totally love the print! !